My horse, A	Patchy, getting trimmed by Don Roof, my farrier since the early 1970s. He is "frog wackin!" The farrier is coming and you have arrived at the barn. What can you do to prepare for your horse's farrier appointment? There are a number of steps you can take to help the farrier and expedite the farrier's time as well as your own. Bring your horse up to the barn or waiting area. We use the stalls in the barn. Groom your horse and pick his feet while you are waiting. Clean up. Notice any potential problems in the feet and be ready to address concerns with farrier. Lock up any wandering pets so that they do not interfere with the shoeing or cause injury to the farrier. Make sure that the work area for the farrier is free of debris and objects of any sort. Make sure that the farrier has a flat and level work area for trimming and shoeing. We have level rubber mats. In bad weather provide a protected work space for the farrier and horse. Tell your farrier if you have noticed your horse if "off" in his way of going. I told my farrier that my horse seemed to be hitching in his stifle. He asked me to ride my horse so he could see how the horse was moving. He then changed the hind end hoof angles about 3 degree and, again, checked the horse's way of going. A horse who will not stand well for the farrier may need to be sedated. Discuss this with your vet and farrier. Always have a horse buddy available because horses are herding animals and do not like to be left alone. If you turn out a newly ferried horse and he goes galloping off the remaining horses will often be upset. If stalls are available put the horses who have been done back in their stalls. All horse hooves do not grow at the same rate. The hoof is much like our finger or toe nails. Some people's nails grow faster and are stronger. The same is true of horses. The amount of work a horse does, the nutrition, health, genetics, ground, weather--can all have an affect on the hoof. In general, a horse should have his hooves done every 6 weeks or so. The horse's frog is also of major importance. Your farrier must also attend to this area. Our horses are bare foot on all four feet. We are lucky that our riding territory is beautifully maintained and not rocky. Both Rusty and A Patchy also have strong feet. They are given farrier's formula every day as a supplement. They get all their shots, vet checks two times a year, excellent grass turn out, good quality hay, and wonderful daily care as well. 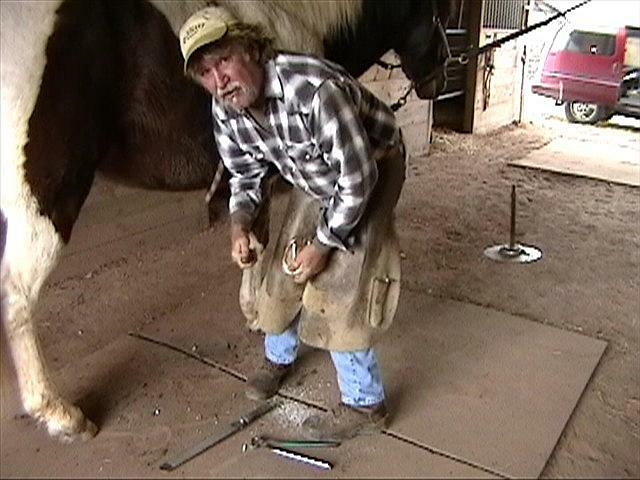 My farrier, Don Roof, comes every 6 to 8 weeks. If we need him sooner he has asked us to call him and he will come. Having trimmed the horses for several years he knows their growth patterns. Don has been my farrier for 24 years except for a stint while we were boarding in Maryland. One of the reasons we moved the horses back to Virginia was because we missed Don. The toe usually grows more rapidly than the heel. When your horse has shoes the toe does not wear down and this can cause many problems if the horse's feet are not tended on a regular basis. For example, a long toe can put undue pressure on the heel of the foot, the hoof may grow and push against the shoe or grow over the shoe causing corns, contracted heels, and quarter cracks. If your horse's feet are not tended by a good farrier your horse can develop seedy toe and abscesses. Added to all this, the angles of the foot change and can cause gait problems, lameness, and inflammation. The discomfort that your horse feels may manifest itself in muscle soreness because your horse tries to compensate for the pain. A horse that has pain can develop other bad habits and not want to perform. He may also develop behavioral problems. I cannot stress enough the importance of an excellent farrier and regular foot maintenance. Remember, "No feet, no horse!"